A deck can be a great way to add value to your home and to provide you with a place to enjoy the outdoors. It will be important that you plan in advance the type of wood you will be using as this can have some bearing on the experience you have. Normally, pressure treated wood is used for this process, but you can find some standard redwood and cedar options that will work, just make sure you seal them once your deck is built. 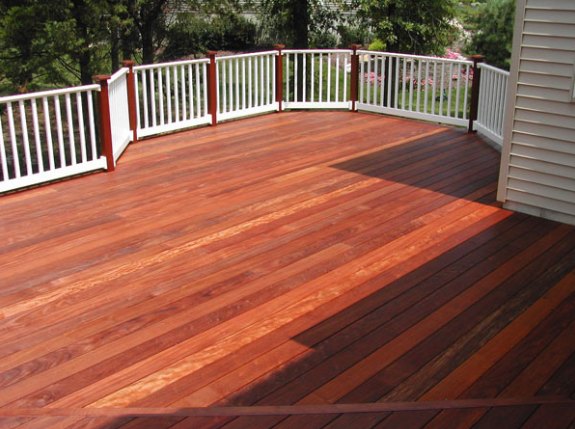 The professionals at O’Leary and Sons are known to build and design quality decks, built to last and impress. The first step on how to build a deck floor is to ensure you have your floor joists setup properly. Then, you can place a straight board on these joists closest to your home. If there are areas that need to be cut out due to objects on the wall, ensure you use a meter saw and measure accordingly. Make sure when you use that you have the proper eye gear in place and that you are focused on what you are doing. Slipping could not only damage the boards, but could also result in injury. When you have the first board in place, pull it out from the wall about 1/8 of an inch to help avoid splitting. Then you can begin to drill screws through the board and into the base. Try to spread these equally across the entire board until it is set. Then continue to measure boards to ensure they are even and check to verify that they appear straight. You will then run them perpendicular along the same path as the other boards, keeping tiny 1/8 gaps between each piece. At the end, you will simply trim the board’s edges to ensure that they are the same length and then smooth them out. Once they are sealed, you can paint the wood if you desire, or you can allow them to maintain their natural beauty and that is how to build a deck floor. If you are considering deck construction colorado springs, or simply refinishing an already existing deck, O’Leary and Sons are the people to work for you. They have quality customer care values and impressive portfolio of work. Call today for a consultation.